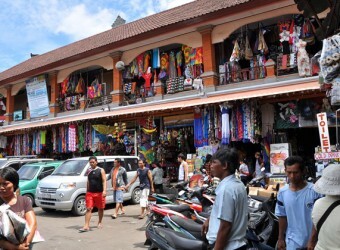 Sukawati Market is on the way to Ubud, and it is good access from the southern resort area. The particular point of this market is that the art market (fancy goods, crafts, accessories, clothes, etc.) for tourists and the daily market (food, snack, kubaya, etc.) are built in the same area to face each other across the road. It is not large scaled market, however, you can have enough things to see.